These high-resolution, high-speed lenses are optimized for the use of 16k pixel line scan sensors with 3.5 µm pixel sizes. There are several lens models, each optimized for a specific magnification range. The 62mm image circle meets the length of many currently available 16k CMOS lines and will cover most 12k line scan lengths as well. The high resolving power of these lenses make full use of the sensor‘s 3.5µm pixel size and fully exploits all possibilities of the latest sensor generation. The lenses are robust and have lockable focus and iris. The 400 – 1000 nm broadband coating makes it suitable for applications in the visible and the near infrared spectrum. The V-mount makes it easy to rotate the lens into the “best azimuth” position to provide the highest performance for a wide range of high resolution applications using today’s most advanced sensors and cameras. 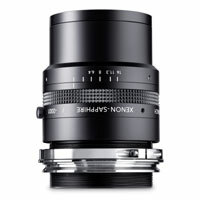 The Xenon-Sapphire series lenses all have an M52 x 0.75 front thread to accommodate various mounted optical filters. Lenses marked with * will image on a 16K sensor with 5μm pixel size.